Opened the manhole cover and was suprised to find that this laminated maple top was actually a spruce sandwich with maple on both sides...and with flames at that! Well, first things first...need to get the neck heel repaired. Decided to go with Z-Poxy's 30 Minute Formula. 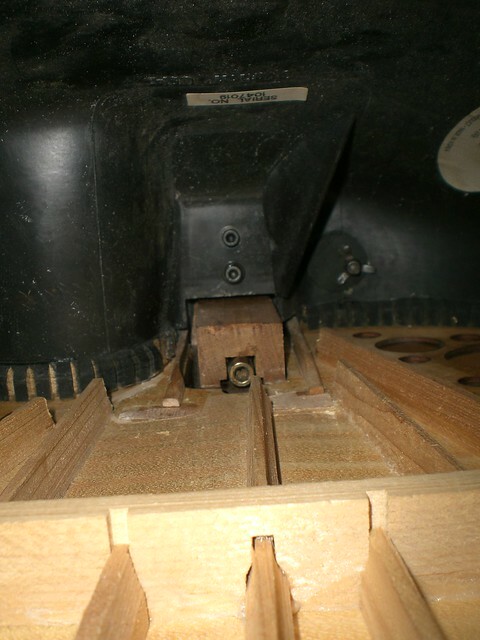 It's not exactly the strongest adhesive, but a well fitted neck heel does not undergo a lot of stress like a bridge/top. So, I'm thinking it will suffice? Back in the day in Japan, these guitars retailed for about a $1000 with a street price of $800 (soft case included). They were like the "AX" O models being sold today, and they were pretty popular. You'll find them auctioned off at premium prices over here, but they don't come up very often. Sure hope I can get this thing back to its former glory...come to think of it, a nice nylon stringed O would round out my collection nicely. Wish me luck! Location: Lake Forest, CA Yep. That's an unusual guitar, all right. 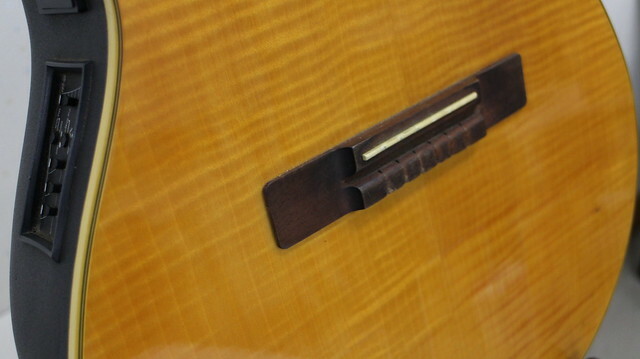 The 14-fret nylon is the same as the 1124/1624 Country Artist series. FWIW, Patch's parlor will also be a 14-fret nylon. 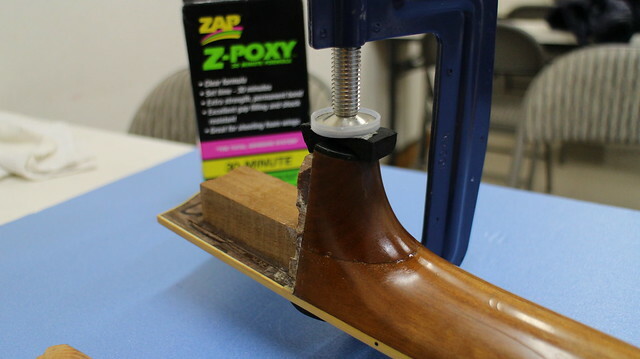 Zpoxy 30-minute epoxy should do fine for this application. The two main differences between 9462 and 0151 is that 9462 is white-ish and has a Tg of ~350 degrees. 0151 is clear and has a Tg of ~160 degrees. The clear makes it easier to glue because, well, it's clear. 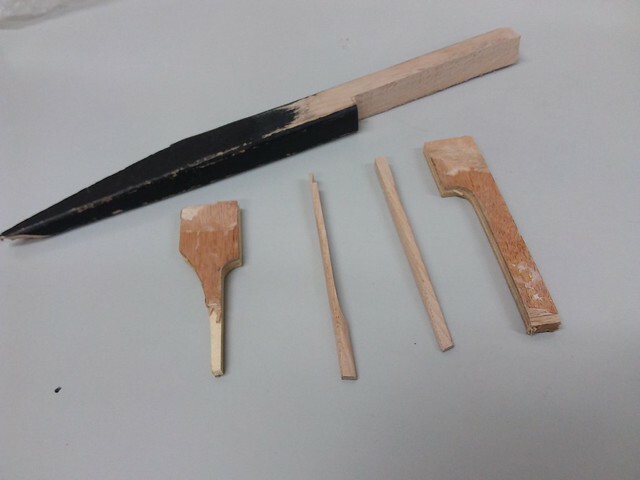 The lower Tg means that the glue can be softened and joints separated without burning the wood or finish. Yep. That's an unusual guitar, all right. Yeah, the CS249 is kind of a funky combination, but was really popular over here. Can't wait to hear Patch's parlor. That is one beautiful guitar and you've really perfected your craft! Btw, I meant to ask, and I shoulda asked in your thread, but since your here... did you get that rosette from the Mother Ship? I really appreciate the info about Hysol 0151 too. 9462 is now a regular part of my adhesive arsenal, but it is really intense. I like the lower Tg and clear color of the 0151. Definitely will pick some up the next time I'm out in the States! Location: Lake Forest, CA No, Patch supplied the rosette. Location: Muenster/Germany The bracing of this guitar should easily stand the tension of light steelstrings. It has more braces than my old Ovation 12string guitars. I would even say that it is "over-braced". This guitar top will never make any trouble...and probably low feed-back when played loud. 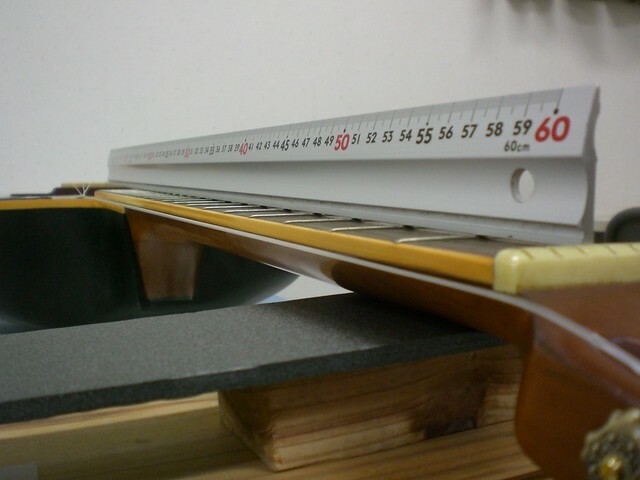 The bracing of this guitar should easily stand the tension of light steelstrings. It has more braces than my old Ovation 12string guitars. I would even say that it is "over-braced". This guitar top will never make any trouble...and probably low feed-back when played loud. This probably came from the factory with a stressed neck joint area. You can tell there is bowing on both sides of the neck cavity. 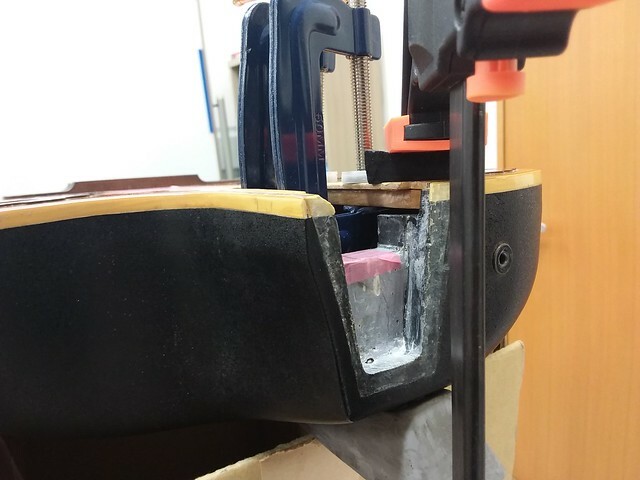 The laminated support blocks have been removed in the picture below. 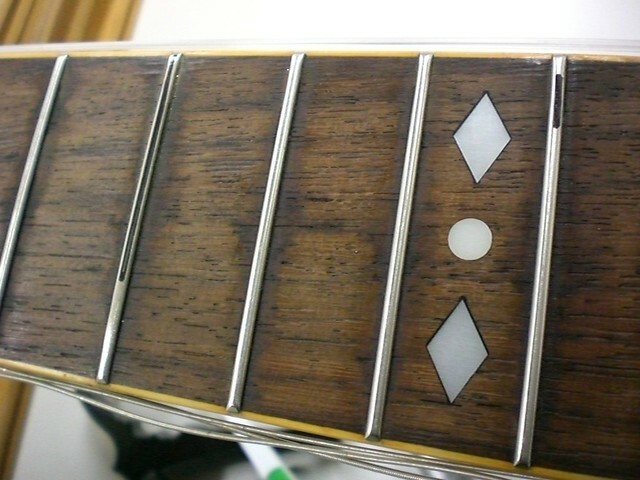 Buldging tops like this are not uncommon with Celebrities, but they wreak havoc on the reassembled guitar. Even good adhesives (at least for this kind of application) will give after several years of use. 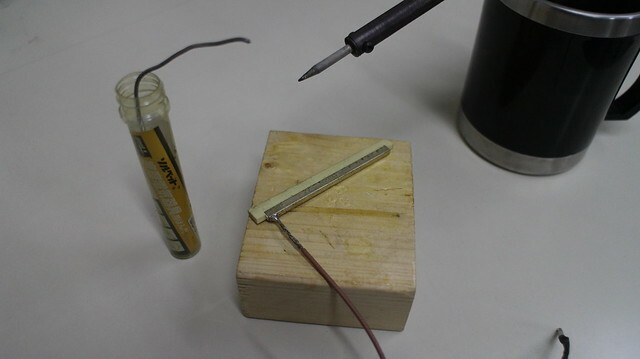 In most cases, the adhesives used on instruments are intended to maintain the structural integrity of components that are built with precision. Good fit enables the adhesives to do their job. Keep things rigid, but when components fit poorly, the adhesives need to work extra hard for a long time to keep things bent or filled eventually leading to failure. 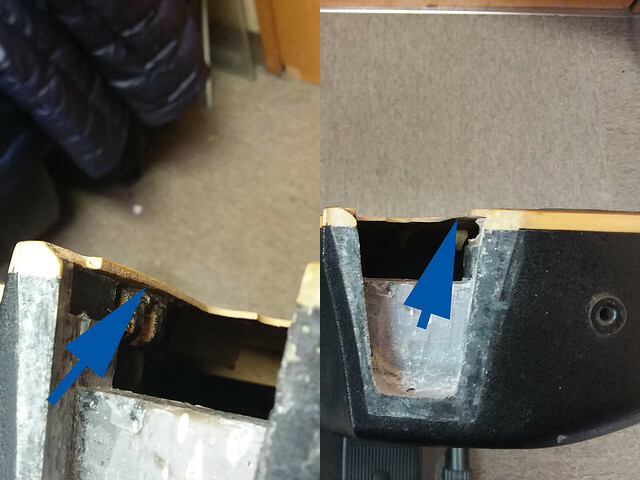 I can glue this back together as is, and the guitar will probably hold together for several years, but eventually the neck will start rocking back and forth and the joint will fail again. Since the laminated support blocks are always problematic when removing the necks from Celebrities (they inevitably split and crack as the neck is removed) I've decided to rebuild this area. After removal of the laminated support blocks, I cut out some new braces to replace the blocks. Years ago, a friend of mine gave me a bunch of old hockey sticks that he wasn't using. They are made from high quality Birch and they are perfectly suited for high stress bracing areas like this.. The laminated blocks are on the outside and the new Birch braces between them. Birch can be cut with intricate patterns without losing integrity. My Dremmel Moto-Saw comes in handy for jobs like this. The left Birch brace is cut to fit right under the cutaway side of the neck joint. Carefully clamped the right side and waited 24 hours for full-cure of the adhesives. A good clamping strategy is really important. Dry runs, dry runs, dry runs! Clamped the left side and waited another 24 hours for full-cure. This guitar is going to get a bolt-on neck, and my drilling jig had to be upgraded. The unit is made from acrylic and is used to accurately position the drill for the inserts in the neck heel and the holes in the bowl. 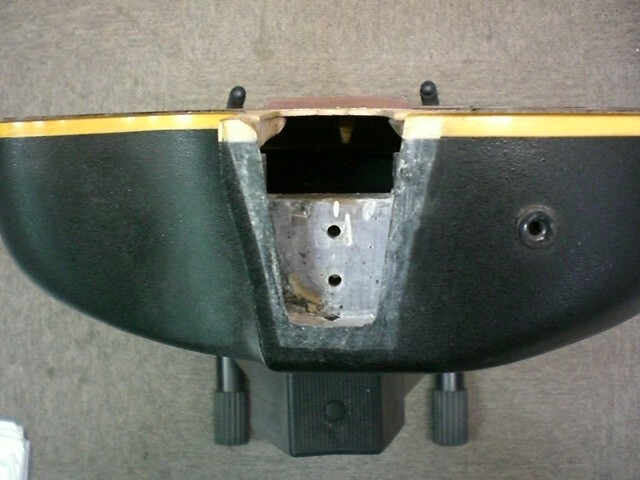 From this position, the bolt inserts can be positioned precisely in the neck heel. From this position, the holes can be drilled into the bowl with precision. The key is alignment! The center lines in each component has to be marked with precision. At this point, I'm ready to start drilling the holes and preparing the neck with the inserts. Making progress surely but slowly! More to come in a couple of days! Location: Lake Forest, CA It's coming along nicely, Ken. I like your neck bolt drilling jig. Location: Muenster/Germany All this looks familiar. 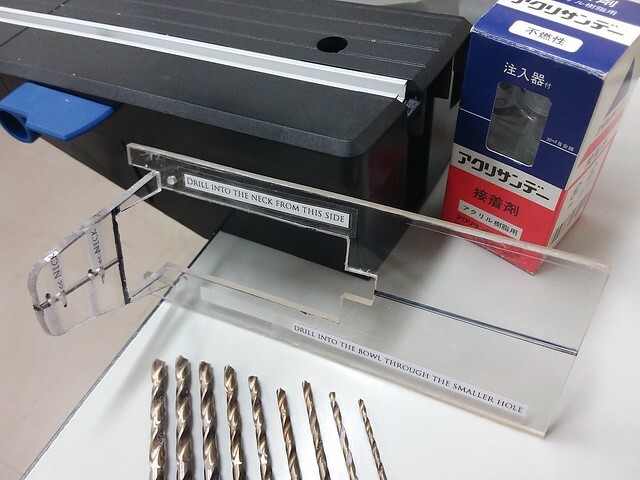 Your drilling jig is great! And I love your constructions, most of the time better than the original. The inserts are seated 3mm into the hole and covered with more Hysol 9462 (this stuff really is amazing) with the bolts screwed in. 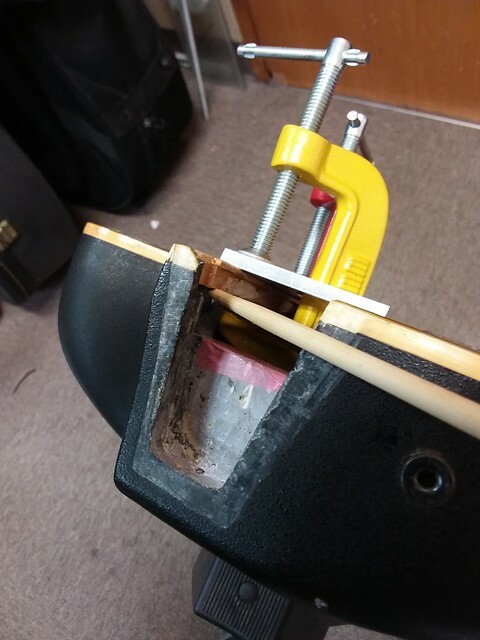 After 24 hours, the adhesive is basically cured, but will allow the threads to cut-out of the inserts without clogging or compromising the insert's ability to receive the bolts. After 48 hours, Hysol gets really hard, and I don't want to find out that I've got a bolt stuck in the insert with no hope of removal! 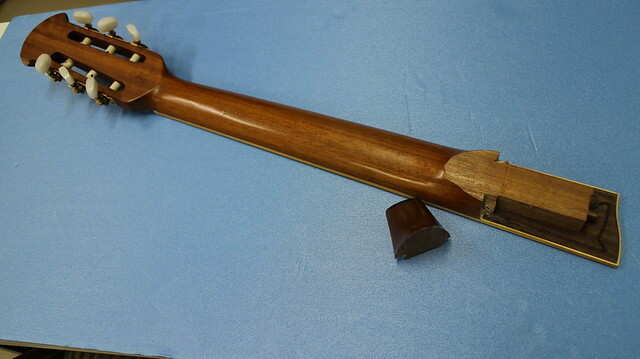 In addition to the bolt and insert holes, there was a need to rebuild the heel of this neck. 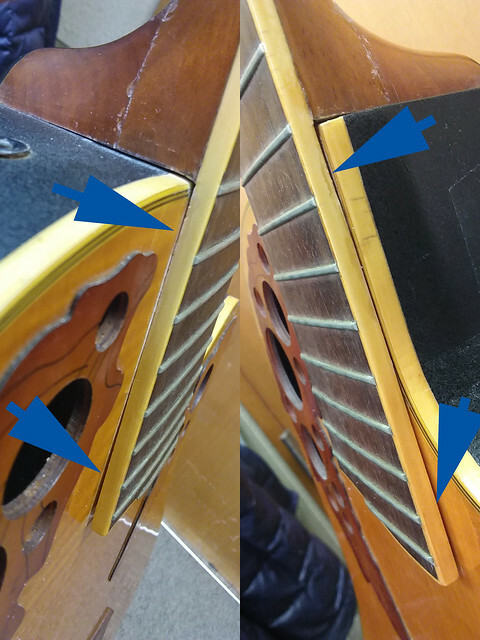 The process is the same as when I worked on the CC247, but years of rocking in an unstable neck joint wore down the neck heel/body joint area. it was also probably chiselled a bit as well. The Birch braces that helped to flatten the top really amplified this issue. Again, I filled the neck heel with Smooth-on's Smooth-Cast Onyx black casting resin. Like Hysol, this stuff really works great. 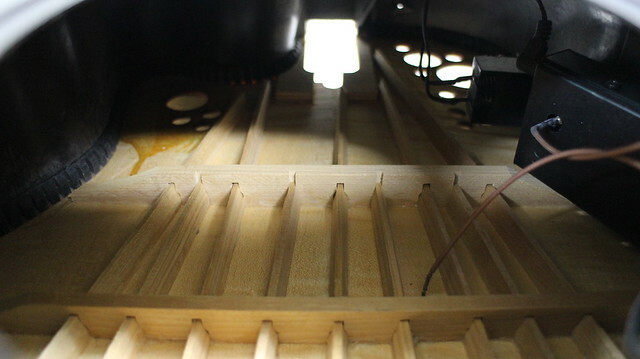 In the photo, the resin is already hardened, and needs to be shaved down to fit final specs. When compared to the previous photo, you can kind of tell that a lot had to be shaved off. 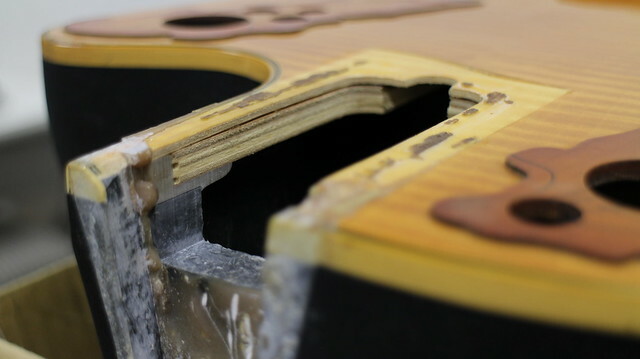 To ensure proper intonation and fit (including neck angle and alignment) about 2mm to 2.5mm needed to be shaved off leaving approximately 1mm to 1.5mm of black resin. That is a lot of added material to a neck heel. Inigo Montoya: I do not suppose you could speed things up? Man in Black: If you're in such a hurry, you could lower a rope, or a tree branch, or find something useful to do. Inigo Montoya: I could do that. I've got some rope up here. But I do not think that you would accept my help, since I am only waiting around to kill you. Inigo Montoya: But I promise I will not kill you until you reach the top. Man in Black: That's very comforting. But I'm afraid you'll just have to wait. Chiselling and scraping down the neck heel took quite a bit of time, but the adhesive needed to dry anyway...just glad the long wait is over (for now, at least) to make a little bit of progress. It's time to glue the neck back into place. Contemplated just going with CA glue, but there were still some gaps that needed to be filled, and it became apparent that there was going to be some amount of 'load' where the neck extension glues to the body. Decided to go with a Japanese brand epoxy for this step. 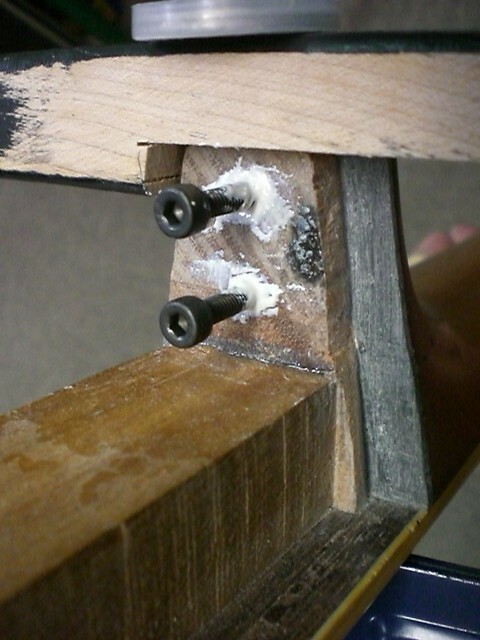 After administering a thin coat of glue to both the body and the neck (not the heel as that will be secured using the bolts), the neck is positioned in the body and bolted on lightly. 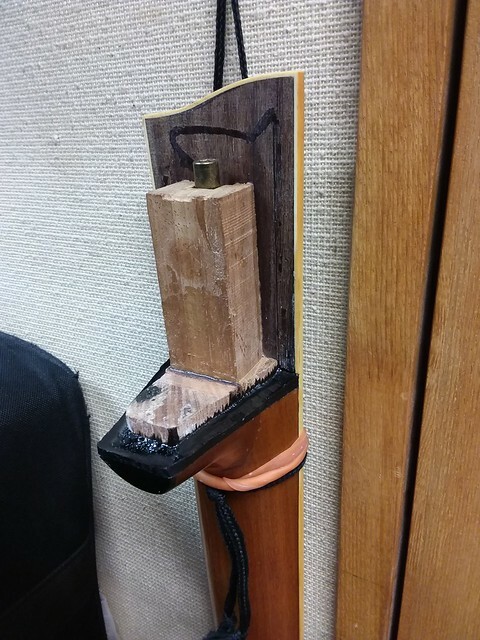 My "door-stop" clamping jig actually works really well. 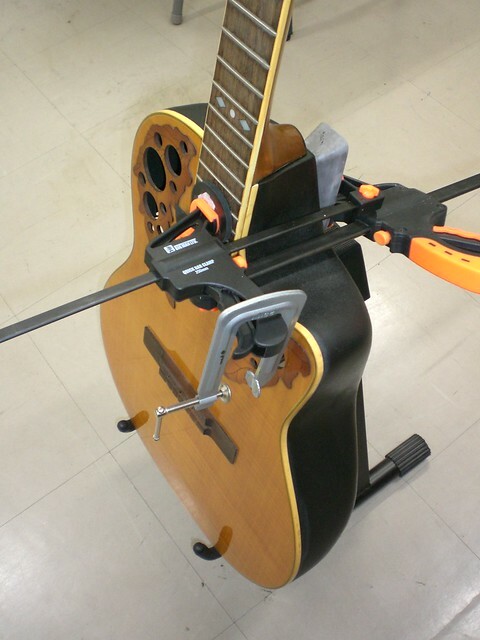 It is hard enough to provide clamping power, but soft enough to "give" without destroyed the clamped components. Once the clamps are in place and position is verified. I go in and tighten the bolts to about 80~90% tightness. ...but then I suddenly hear a voice inside my head, "You can do more Ken. 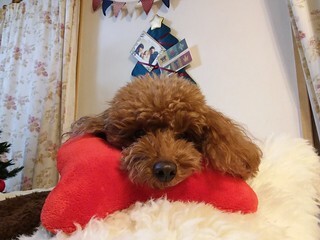 You can do more!" No, no, no, I say to myself, "Don't touch the guitar...just let it sit. Just 3 days! 3 days! You can wait 3 days!" Decided to change out the old and tired white tuning pegs for some new/but inexpensive black ones....HMMMMMMM! I like it! ...and you know, this is how impatience ruins perfectly good projects before they ever reach completion! One dropped tool; one drop of the guitar or bang into a wall or door post and it's over... was fortunate that didn't happen this time! Sheesh...at this rate, I'll never be a real luthier, I hate waiting... oh, but she is coming along nicely...can't wait to string her up and take her for a spin! Location: Lake Forest, CA Really nice write-up Ken. I haven't been commenting too much, but I have been avidly following your progress. The braces on this guitar are complete overkill, especially for a nylon string guitar. Location: What week? You guys are so much more brave than me. If I were to attempt any of this, and post it here, it would be more like watching a wreck happen in slow-photo-motion. You guys are so much more brave than me. If I were to attempt any of this, and post it here, it would be more like watching a wreck happen in slow-photo-motion. Who doesn't love a slo-pho-mo wreck? EweToob is full of 'em! arumako: Like Dan, I've enjoyed reading your build. Love the drilling jig! Thanks for the encouragement everybody! Now, I wish "courage" was my source of inspiration; however, my slo-pho-mo projects are the ones that never get posted! Oh, and there are a few of those...just a peek into my make shift tatami mat shop with the caved in tops and peeled off bridges decorating the walls testify of that! May this project not end this way! With that, let's push forward! I then used my fret hammer (basically a urethane tip hammer) and lightly tapped the frets to ensure they were seated properly. 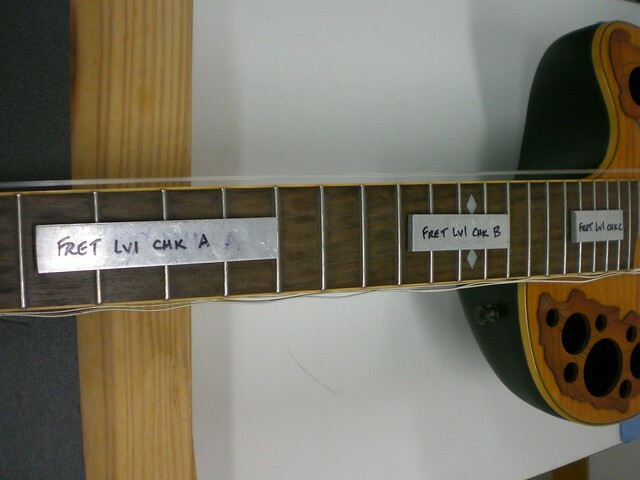 Many of the frets were floating just a tad. Needed to whip out the CA glue to adhere them into position. 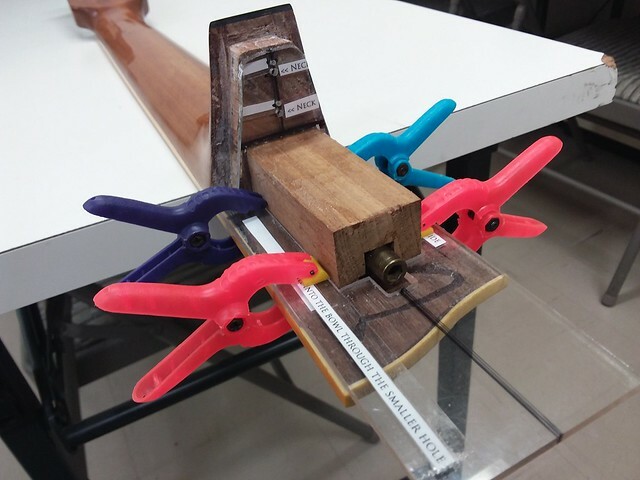 A drop of high viscosity CA glue is applied to the tip of an exacto knife...just touch the tip to the joint between the fret and the fretboard; and viola, the adhesive wicks itself into the groove. 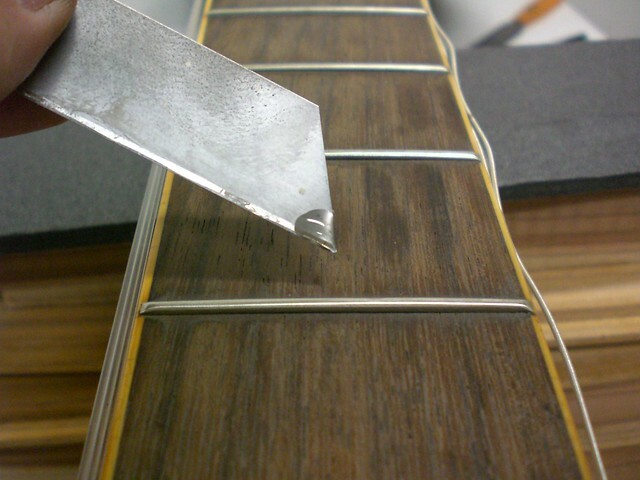 Every fret that is marked is leveled with a fret crowning file (in this case my 2mm file) until the rocking is eliminated. It's a pretty time consuming job, but absolutely necessary to ensure "fret-buzz" freedom. The last thing to do, was to get the battery case installed. The bolts and backing plate were completly rusted together and had to be drilled for removal. 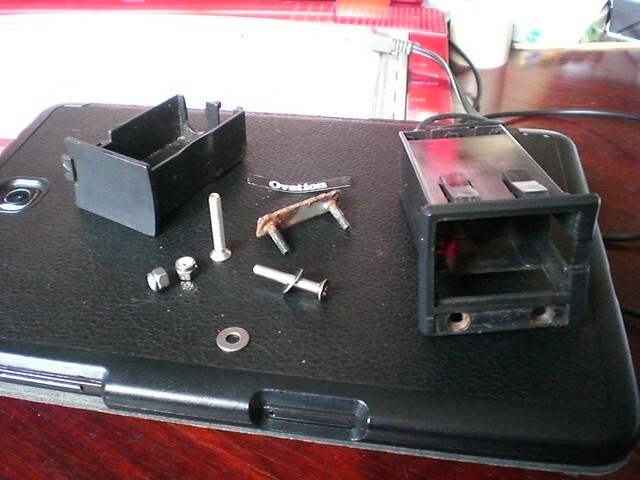 No backing plate availability here, and so I opted for some nylon locking nuts. The "Ovation" screw cover needed some fresh double-stick tape on the back, so that was refreshed and put back together. Now, I think we're ready to take her for a spin! Oh, I should mention this amplifier. 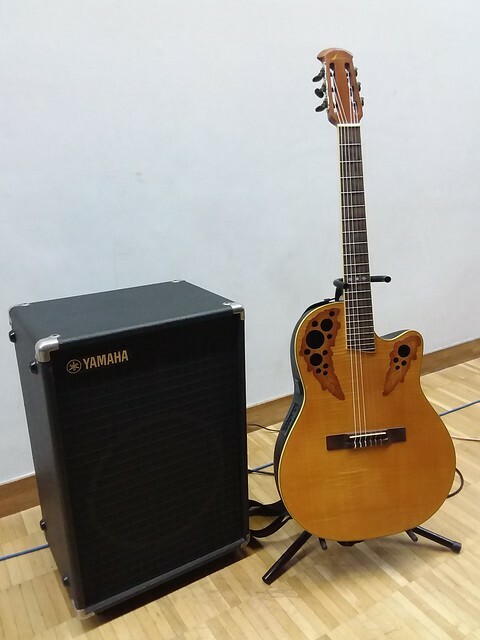 It is a Yamaha KS-50, a small (& heavy!) super reliable 40W keyboard amp. I've tried a lot of acoustic amplifiers, but this little baby delivers like no other amp I've tried. It is not designed to make the player 'sound' good. It is designed to amplify and reproduce the source with exacting efficiency. The circuitry is pretty simple, and these are auctioned over here in Japan for anywhere between 25 bucks to 75 bucks. My other fav amp is a Peavey Session 400 steel guitar amp (she's getting maintenanced right now with all new caps throughout), Not exactly "forgiving" amps. These are no frills simple discrete circuit amps, but they are true tone producers. Anyway, this nylon string guitar is easy to play. As is typical of most Os, the action is very low for this sort of configuration. She's currently wearing medium gauge/medium tension strings, but they feel a bit loose, so I ordered high-tension strings for her. The wider classical-ish neck feels really good in my hands too. Now, how does she sound? Electronically she sounds fine, a bit on the bassy side, but relatively balanced - I think; however acoustically? Well, how should I put this? I think...it sounds like, you know, if I put strings on the MDF coffee table I bought from IKEA (they have IKEAs in Japan, meatball lunches and all! )...let's just say, I'm not inspired. So, as you all might have guessed, the K-3 Classical bracing is a kind of resonance killer. I'm no engineer, but as DetlefMichel suggested, it seems the bracing is designed to bring balance to the sound produced by the pre-amp. It definitely is not my mother's classical guitar (well, literally, the classical guitar "standard" in our home is my Mom's '68 Saburo Nogami - Brazilian Rosewood, German Spruce handmade true Luthiery beauty). 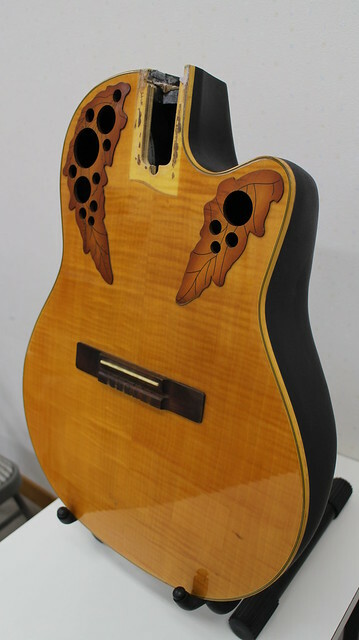 The laminated flame maple top, the 14th fret neck/body joint, and the bracing suggests that this nylon string was intended to be played through an amp only. the real fun begins from here! Oh I hope, I don't demolish this thing and turn this into a slo-pho-mo project! I love to watch you guys fix these and someday I may aspire to some minor luthery. So how are you going to try to improve the sound acoustically,shave braces ???? I have owned a couple of 1624's and a 1613. Plugged in...great nylon/classical sound...unplugged acoustically...they are just not up to the resonance of an all wood classical....low volume, short on sustain, imo. I wouldn't blame it on the bracing...for some reason, the nylons don't drive the soundboard or maybe the bowl is to blame. Or maybe it is me. Thanks for the timely input/caution jay. Are the 1624 and 1613 X-braced? Fan braced, maybe? Either way, I'll give serious consideration before proceeding. If the 1624 and 1613 aren't acoustically inspiring; then it might be the bowl or some other factor that I'm completely missing. 1116 - Concert Classic, Nylon strings, Deep bowl, VT 10 bracing, 2" nut width. 1124 - Country Artist, Steel strings, Artist bowl, VT 8 bracing, 1 7/8" nut width. You will probably find a consensus that the deep bowl did make a profound difference acoustically between these two nylons. Location: SoCal The deep bowl most people thing about is the 1113/1613/1763 -- the deep bowl classical. It had fan bracing. 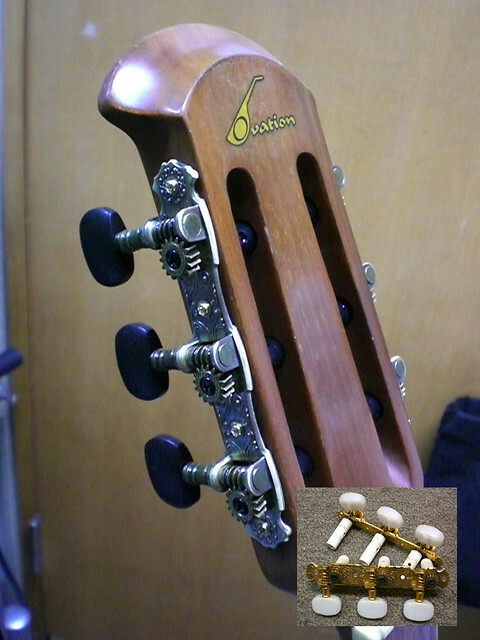 The 1113/1613 used Ovation's double-fan braces. 1) The top is too thick. Traditionally, steel string guitar tops are ~.100" thick. 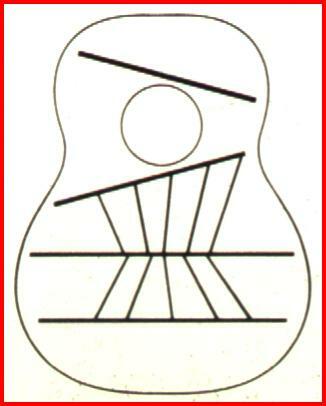 Nylon string guitars are ~.093" thick. 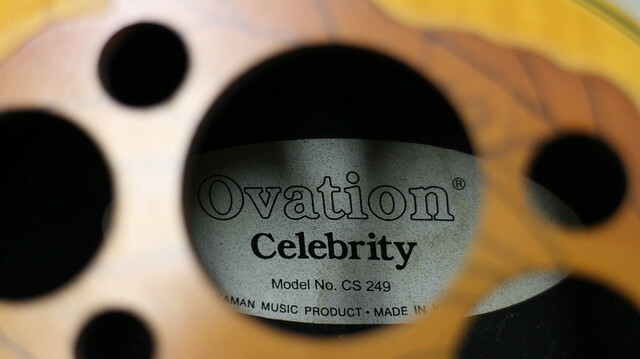 Ovation guitar tops are tapered top-to-bottom from ~.140" to ~.100". 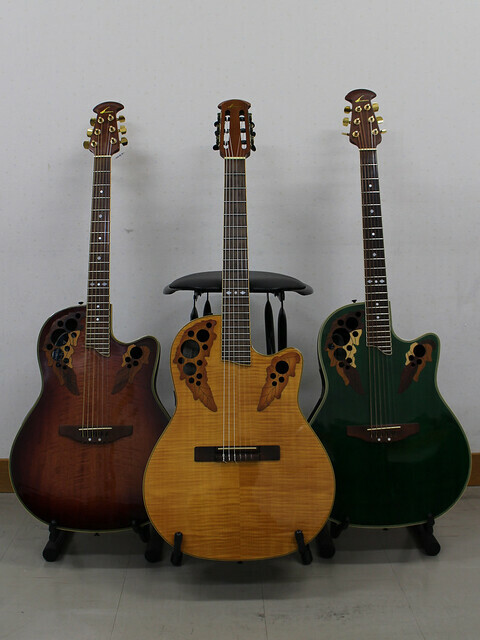 Thicker tops means better durability, but lower response, especially with nylon strings. 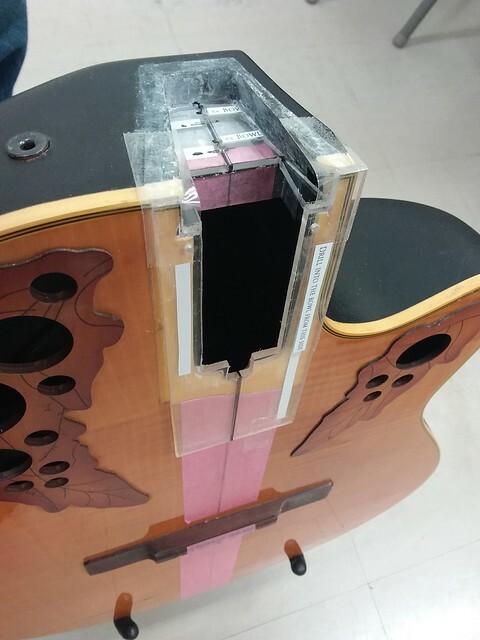 Guitar manufacturers started tucking braces under the lining, not because it sounds better, but because it reduces warranty work due to bracing glue joints that have popped off the top. The problem is that tucked braces also reduce top response. 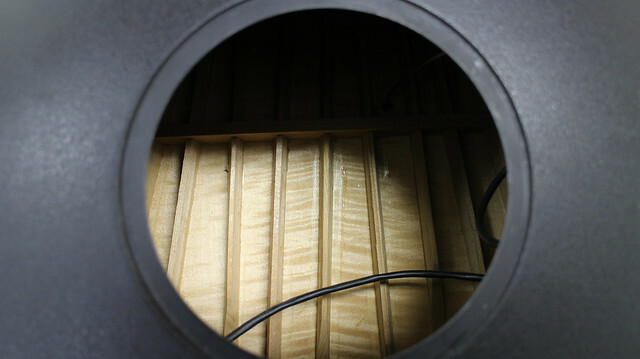 The end result of these two features means that the nylon topped Ovations will be less responsive than their traditionally-built wood brethren. WRT this guitar's braces I'm reminded of an expression we used when describing the construction of model airplanes -- The more you beef it up, the more it'll fly like a cow. Same for guitar construction. Personally, I would leave this guitar alone. No amount of shaving is going to make these braces sound good when played acoustically. Location: Lake Forest, CA FWIW, the top on Patch's parlor is ~.095" with no taper. Location: SoCal What is the top thickness on my 1113? Location: Lake Forest, CA As I recall, tapered from ~.110" - ~.95". But, it's also Adi spruce, with is stiffer than cedar or Sitka spruce.